Have you ever signed up for a book subscription? It is like the old Book of the Month Club but in modern form. You enroll and agree to pay for and receive a book each month. There are many of these, some from small presses, some from outlets like the New York Review of Books. You agree to take what you get. It is like Christmas or your birthday once a month. As I have mentioned before, I have been enrolled in the Nervous Breakdown Book Club since 2015. I haven't loved every book I've received but I have been introduced to many gems I might otherwise not have found on my own or might have passed over. Sometimes I get a brand new hardcover by an author I love for only $9.99, the monthly fee. However, like other books I buy, I don't always get around to reading them. In fact, out of the 43 books I've received over the years, I have 21 sitting on a special shelf waiting to be read. I feel guilty. RIFT was the December, 2015 selection and the remaining unread 2015 book. In a rather OCD moment, I opened it to read. As you may also remember, I am not a fan of short stories. 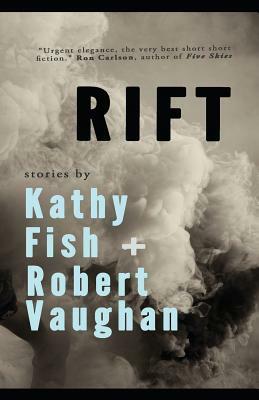 RIFT is a collection of stories by two different authors. Not only are these stories short, they are super short and fall into a sub-genre of short stories known as 'flash fiction." Some are only a page long, none are more than six pages. OK, I thought, I'll read a couple a day. How long can that take? Over the weeks a wondrous phenomenon occurred. My problem with short stories is they are too short. I like to settle in to a story and stay for a while. I think nothing of reading novels that are 800 to 1000 pages long. As I read these well-crafted though sometimes quirky pieces, I was impressed by how well most of them created in my mind a complete picture of character, place, and even of time having passed. I have been terribly blocked on my own writing project for a few years. I lost my momentum and have not been able to get it going again. The best I have been able to do is once in a while write a short scene or collection of memories about an incident. Reading these flashes of writing by Kathy Fish and Robert Vaughan, I realized that I have been doing something similar with my project. I checked on the chapter I'd been struggling over for so long and saw that almost all the pieces are there. I have not been writing flash fiction but I have been writing flash autobiography! I am now well into putting that chapter together. Some of the bits I wrote are in the wrong place and will go into other chapters, but the writing that I thought was just me being lame, or worse, lazy was in fact the way I dealt with my writer's block. If you are still reading (I thank you and apologize for going on so long) you may be a writer yourself. You may have had a similar problem. I exhort you now to just keep reading books and keep jotting down something at least now and then. You too can break through. Most of all, I thank Kathy Fish and Robert Vaughan and Bud Smith (the publisher of Unknown Press) and Brad Listi, who runs the Nervous Breakdown Book Club, and whatever goddess watches over me, for bringing me just what I needed. We never know from where inspiration will come, but it certainly sounds as though this book has inspired you to think positively and creatively about your own writing. Good on you! That is so true Dorothy. I wrote a song about it once. Called it "Inspiration." Title song of my last CD. You can find it on CDBaby. I was always a fan of short stories, I even wrote short stories (as well as poetry) as a child and during my teenage years. After awhile, I stopped reading them, writing them too, not sure why. This year I have read one collection of general fiction short stories and one nonfiction essays collection. Both have been memorable in their own right. Lucky me! I chose the right works to be re-introduced to the genre. You know, Carmen, I always try to make things happen by hard work and try not to believe in luck. But serendipity and luck do happen. I have had lots of it in life and it sounds like you've had some too. Do you think you will write stories again? Thanks for filling me in on your writing efforts. I get it. I think about quitting my blog at least once a week. But I know you would not let me-:) As far as getting in trouble goes, I think it goes with the territory and proves you are really saying something! Sounds like you had a good breakthrough. It's nice to hear about. Who knows where or when little sparks in our creativity come from ... just keep going & reading & making notes is sound advice. Yup! And the next time I get stuck, remember the breakthrough. So hard to do when one is stuck.